Debutant Peter Odemwingie scored a late winner as West Brom secured a deserved win over unadventurous Sunderland. The Uzbekistan-born striker missed an earlier chance when clean through but made no mistake with nine minutes left as he slotted in James Morrison's pass. The Black Cats rarely threatened with Kieran Richardson and Nedum Onuoha providing some rare spark late on. Chris Brunt was outstanding in the middle for the Baggies and crashed a shot against the crossbar near the end. Showing no signs of a hangover from last week's 6-0 drubbing by Chelsea, the hosts, bar a wobbly five minutes after the hour, looked full of verve and creativity with Brunt in particular pulling the strings from the middle and out wide. And it was the Northern Irish midfielder who ripped open the visitors' defence early on to set up new team-mate Odemwingie for a glorious chance to open the scoring. However, just 24 hours since moving from Lokomotiv Moscow and securing international clearance on Friday night, the forward, who plays for Nigeria, looked a little jittery and hooked his weak shot wide of Scott Carson's right post. 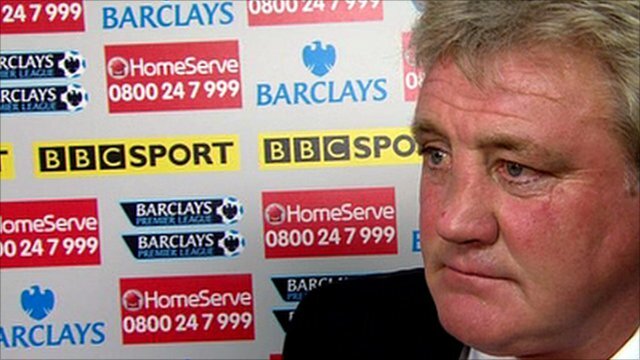 With boss Steve Bruce sticking with front men Darren Bent and Fraizer Campbell on the back of last week's two-goal surrender to Birmingham, Sunderland looked shockingly bereft of attacking ideas and were restricted to two tame free-kicks in the first period. First win. First clean sheet. First goal for Odemwingie. Nice! Scotland's fit-again Morrison was another proving a handful for Bruce's new look defence as he blazed wide from the edge of the box before crossing for Brunt, who could only head off target. West Brom, eyeing just a third win in 18 Premier League matches, continued to dominate proceedings and came within a few inches of a spectacular opener before the break. Defender Marek Cech out-sprinted the Black Cats' defence and whipped the ball in for the unmarked Brunt to produce a stunning overhead kick but had to watch it fly narrowly over the bar. The momentum remained in West Brom's favour in the second half as Sunderland's Belgian goalkeeper Simon Mignolet was called into action yet again as he smothered a Brunt header. Bruce waited just past the hour to introduce new faces, introducing Danny Welbeck and Boudewijn Zenden, and for a few minutes, the visitors briefly came alive. But keeper Carson was up to the test as he tipped over Richardson's 25-yard shot and then comfortably held on to a header from on-loan defender Onuoha. As Sunderland ran out of ideas and seemingly unwilling to battle for three points, they suffered a sucker-punch as Odemwingie picked up Morrison's cute through-ball to cap a lively first game in West Brom's colours with a well-taken goal. There was even time for Brunt to get within a whisker of a deserved goal as he blasted against the bar. 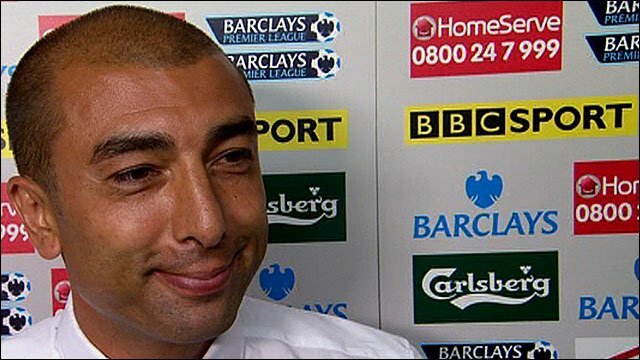 A job well done for Roberto Di Matteo's team but sterner tests await with trips to Liverpool, Arsenal and Manchester United coming up. "We played some great stuff and created some very good chances. "I have belief in my players and they gave me exactly what I was looking for. We're happy to have three points." "We have to improve, and we did in the second half. But it shouldn't take me ranting and raving at half-time. "Mentality is what it is, and we have to try to change that if we are going to improve and take the club forward." 90:00+4:03 The referee signals the end of the game. 90:00+2:57 Nedum Onuoha sends in a cross, Foul by Boudewijn Zenden on James Morrison, free kick awarded. Scott Carson takes the indirect free kick. 90:00+2:45 Attacking throw-in by Martyn Waghorn (Sunderland). 90:00+2:16 Chris Brunt gives away a free kick for an unfair challenge on Kieran Richardson. Simon Mignolet restarts play with the free kick. 90:00+0:58 Defending throw-in by Marek Cech (West Brom). 90:00+0:39 Defending throw-in by Marek Cech (West Brom). 90:00+0:18 The ball is swung over by Boudewijn Zenden, Marek Cech makes a clearance. 89:43 Corner taken by Martyn Waghorn played to the near post, Marek Cech makes a clearance. 88:54 Inswinging corner from left by-line taken right-footed by Jordan Henderson (Sunderland) to centre, clearance by Jonas Olsson (West Brom). 87:57 Fraizer Campbell fouled by Steven Reid, the ref awards a free kick. Jordan Henderson crosses the ball from the free kick right-footed from left channel, blocked by James Morrison. 87:57 Booking The referee shows Steven Reid a yellow card for unsporting behaviour. 87:21 Shot by Chris Brunt (West Brom) left-footed from left channel (30 yards), hit bar. 86:01 Chris Brunt takes the inswinging corner, Paulo Da Silva manages to make a clearance. 85:48 Attacking throw-in by Gonzalo Jara (West Brom). 85:23 Substitution Nicky Shorey on for Youssouf Mulumbu. 85:07 Goal kick taken long by Scott Carson (West Brom). 84:53 Shot by Martyn Waghorn (Sunderland) left-footed from left side of penalty area (6 yards), missed left. 83:59 Outswinging corner from left by-line taken left-footed by Boudewijn Zenden (Sunderland) to near post, resulting in open play. 83:59 Substitution Sunderland substitution: Cristian Riveros replaced by Martyn Waghorn (tactical). 83:43 Kieran Richardson crosses the ball, clearance made by Chris Brunt. 82:51 Free kick crossed right-footed by James Morrison (West Brom) from left channel, resulting in ball out of play. 82:51 Booking Titus Bramble (Sunderland) booked for unsporting behaviour. 82:51 Foul by Titus Bramble (Sunderland) on Giles Barnes (West Brom). 81:44 Substitution West Brom substitution: Graham Dorrans replaced by Steven Reid (tactical). Correction - 81:14 Shot by Danny Welbeck (Sunderland) right-footed from left channel (18 yards), missed right. 81:14 Boudewijn Zenden has an effort at goal from the edge of the area that misses to the right of the target. 80:02 Assist (pass) by James Morrison (West Brom) from right channel. 80:02 GOAL - Peter Odemwingie:West Brom 1 - 0 Sunderland Goal by Peter Odemwingie (West Brom) right-footed (bottom-left of goal) from centre of penalty area (12 yards).West Brom 1-0 Sunderland. 79:32 Gonzalo Jara takes the free kick. 79:32 Booking Paulo Da Silva is cautioned. 79:17 Foul by Paulo Da Silva on Peter Odemwingie, free kick awarded. 78:38 Foul by Gonzalo Jara (West Brom) on Boudewijn Zenden (Sunderland). Free kick crossed right-footed by Jordan Henderson (Sunderland) from left wing, clearance by Gabriel Tamas (West Brom). Correction - 78:25 Attacking throw-in by Kieran Richardson (Sunderland). 77:18 Goal kick taken long by Simon Mignolet (Sunderland). 76:50 Boudewijn Zenden sends in a cross, Nedum Onuoha takes a shot. Save by Scott Carson. 76:11 Outswinging corner taken by Jordan Henderson. 75:41 Kieran Richardson takes a shot. Save by Scott Carson. 75:24 Marek Cech challenges Cristian Riveros unfairly and gives away a free kick. 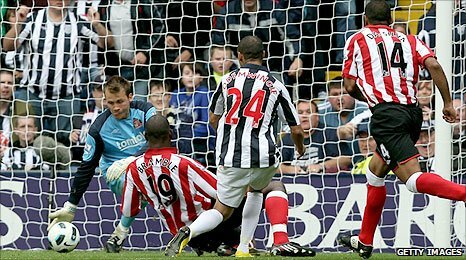 Titus Bramble takes the indirect free kick. 75:07 Peter Odemwingie takes a shot. Paulo Da Silva gets a block in. 74:50 Foul by Fraizer Campbell (Sunderland) on Marek Cech (West Brom). Indirect free kick taken right-footed by Marek Cech (West Brom) from own half, passed. 74:08 Goal kick taken long by Scott Carson (West Brom). 73:58 Boudewijn Zenden produces a cross. 72:43 Shot by Graham Dorrans (West Brom) right-footed from right channel (25 yards), save (caught) by Simon Mignolet (Sunderland). 72:36 Nedum Onuoha delivers the ball, Scott Carson makes a save. 72:03 Defending throw-in by Nedum Onuoha (Sunderland). 71:44 Defending throw-in by Nedum Onuoha (Sunderland). 71:19 Chris Brunt (West Brom) caught offside. Indirect free kick taken right-footed by Nedum Onuoha (Sunderland) from own half, passed. 70:50 Free kick awarded for an unfair challenge on Boudewijn Zenden by Gonzalo Jara. Indirect free kick taken by Boudewijn Zenden. 70:25 Inswinging corner from right by-line taken right-footed by Chris Brunt (West Brom) to centre, resulting in open play. 68:45 Foul by Paulo Da Silva (Sunderland) on Peter Odemwingie (West Brom). Free kick taken right-footed by Graham Dorrans (West Brom) from left by-line (12 yards), save (parried) by Scott Carson (West Brom). 67:09 Handball decision goes against Boudewijn Zenden. Scott Carson restarts play with the free kick. 66:41 Cross by Kieran Richardson (Sunderland), clearance by Jonas Olsson (West Brom). 66:11 Substitution Sunderland substitution: Ahmed Elmohamady replaced by Danny Welbeck (tactical). 65:51 Substitution Sunderland substitution: Steed Malbranque replaced by Boudewijn Zenden (tactical). 65:21 Defending throw-in by Nedum Onuoha (Sunderland). 64:56 The ball is crossed by Jordan Henderson, save by Scott Carson. 64:40 Attacking throw-in by Kieran Richardson (Sunderland). 63:47 Giles Barnes crosses the ball, Chris Brunt takes a shot. Save by Simon Mignolet. 63:21 Attacking throw-in by Chris Brunt (West Brom). 63:02 The ball is sent over by Giles Barnes, clearance made by Paulo Da Silva. 62:00 Defending throw-in by Marek Cech (West Brom). 60:50 The offside flag is raised against Peter Odemwingie. Simon Mignolet takes the free kick. 60:20 Defending throw-in by Marek Cech (West Brom). 58:23 Attacking throw-in by Nedum Onuoha (Sunderland). 58:11 Cross by Cristian Riveros (Sunderland), clearance by Jonas Olsson (West Brom). 57:55 Cross by Nedum Onuoha (Sunderland), clearance by Gabriel Tamas (West Brom). 57:34 Attacking throw-in by Nedum Onuoha (Sunderland). 57:08 Attacking throw-in by Nedum Onuoha (Sunderland). 56:22 Goal kick taken long by Scott Carson (West Brom). 55:13 Foul by Gabriel Tamas on Fraizer Campbell, free kick awarded. Kieran Richardson has a direct shot on goal from the free kick. 54:37 Centre by Giles Barnes, Simon Mignolet makes a save. 53:53 Goal kick taken long by Simon Mignolet (Sunderland). 53:02 Foul by Steed Malbranque on Giles Barnes, free kick awarded. Graham Dorrans fires a strike on goal direct from the free kick. 52:36 Corner taken by Graham Dorrans, Titus Bramble manages to make a clearance. 52:18 Cross by Gonzalo Jara (West Brom), clearance by Fraizer Campbell (Sunderland). 51:56 Giles Barnes crosses the ball, clearance made by Paulo Da Silva. 50:58 Foul by Steed Malbranque (Sunderland) on Youssouf Mulumbu (West Brom). Indirect free kick taken right-footed by Gonzalo Jara (West Brom) from own half, passed. 50:45 Attacking throw-in by Kieran Richardson (Sunderland). 50:03 Peter Odemwingie is flagged offside by the assistant referee. Simon Mignolet takes the indirect free kick. 49:29 Giles Barnes delivers the ball, clearance made by Kieran Richardson. 48:57 Attacking throw-in by Chris Brunt (West Brom). 48:14 Goal kick taken long by Scott Carson (West Brom). 47:09 Foul by Jonas Olsson on Darren Bent, free kick awarded. Jordan Henderson delivers the ball, Headed effort on goal by Darren Bent from inside the penalty box misses to the right of the goal. 47:01 Attacking throw-in by Nedum Onuoha (Sunderland). 46:34 Defending throw-in by Kieran Richardson (Sunderland). 45:53 Foul by Ahmed Elmohamady (Sunderland) on Marek Cech (West Brom). Indirect free kick taken right-footed by Scott Carson (West Brom) from own half, resulting in open play. 45:28 Inswinging corner taken from the left by-line by Jordan Henderson. 45:01 Substitution West Brom substitution: Jerome Thomas replaced by Giles Barnes (tactical). 45:00+1:59 The ref blows to end the first period. 45:00+1:39 The ball is crossed by Chris Brunt. 45:00+0:40 Goal kick taken long by Simon Mignolet (Sunderland). Correction - 44:39 Cross by Ahmed Elmohamady (Sunderland), resulting in open play. 44:39 Cristian Riveros sends in a cross. 44:14 Youssouf Mulumbu gives away a free kick for an unfair challenge on Fraizer Campbell. Jordan Henderson takes the free kick. 41:51 Goal kick taken long by Simon Mignolet (Sunderland). 41:24 Cross by Chris Brunt (West Brom), clearance by Nedum Onuoha (Sunderland). 41:16 Attacking throw-in by Chris Brunt (West Brom). 40:49 Goal kick taken long by Scott Carson (West Brom). 40:10 Foul by James Morrison (West Brom) on Cristian Riveros (Sunderland). Indirect free kick taken right-footed by Titus Bramble (Sunderland) from own half, resulting in open play. 37:59 Marek Cech is caught offside. Free kick taken by Simon Mignolet. 37:31 Attacking throw-in by Marek Cech (West Brom). 36:50 A cross is delivered by Kieran Richardson, save by Scott Carson. Correction - 35:36 Foul by Jonas Olsson (West Brom) on Cristian Riveros (Sunderland). Free kick crossed right-footed by Jordan Henderson (Sunderland) from right channel, save (caught) by Scott Carson (West Brom). 35:36 Jonas Olsson gives away a free kick for an unfair challenge on Cristian Riveros. Jordan Henderson crosses the ball from the free kick right-footed from right channel, save made by Scott Carson. 32:47 Fraizer Campbell concedes a free kick for a foul on Jonas Olsson. Gabriel Tamas takes the indirect free kick. 32:23 Goal kick taken long by Simon Mignolet (Sunderland). 31:59 Cross by Marek Cech (West Brom), shot by Chris Brunt (West Brom) overhead kick left-footed from centre of penalty area (12 yards), over the bar. 31:41 Nedum Onuoha concedes a free kick for a foul on Jerome Thomas. Jerome Thomas restarts play with the free kick. 31:32 Goal kick taken long by Simon Mignolet (Sunderland). 30:26 Attacking throw-in by Gonzalo Jara (West Brom). 30:17 Cross by Graham Dorrans (West Brom), blocked by Paulo Da Silva (Sunderland). 29:27 Cross by Jerome Thomas (West Brom), clearance by Jordan Henderson (Sunderland). 29:13 Attacking throw-in by Marek Cech (West Brom). 28:49 Goal kick taken long by Simon Mignolet (Sunderland). 28:21 Shot by Marek Cech (West Brom) left-footed from left channel (18 yards), missed right. 28:13 Centre by Jerome Thomas. Correction - 27:04 The official flags Jordan Henderson offside. Scott Carson takes the free kick. 27:04 Jordan Henderson (Sunderland) caught offside. Indirect free kick taken right-footed by Scott Carson (West Brom) from own half, resulting in open play. 26:33 Corner taken by Jordan Henderson, clearance by Chris Brunt. 26:25 The ball is sent over by Kieran Richardson, Marek Cech manages to make a clearance. 26:04 Nedum Onuoha fouled by Jerome Thomas, the ref awards a free kick. Ahmed Elmohamady takes the indirect free kick. 25:30 Attacking throw-in by Kieran Richardson (Sunderland). 25:22 Attacking throw-in by Kieran Richardson (Sunderland). 25:12 Cross by Kieran Richardson (Sunderland), blocked by Gonzalo Jara (West Brom). 24:15 Cristian Riveros takes a shot. Blocked by Jonas Olsson. 23:40 The ball is delivered by Jerome Thomas, Paulo Da Silva makes a clearance. 23:11 Inswinging corner from right by-line taken left-footed by Chris Brunt (West Brom) to far post, save (parried) by Simon Mignolet (Sunderland). 22:58 Peter Odemwingie produces a cross, Paulo Da Silva gets a block in. 22:08 Defending throw-in by Gonzalo Jara (West Brom). 20:41 Attacking throw-in by Jordan Henderson (Sunderland). 20:19 Defending throw-in by Nedum Onuoha (Sunderland). 19:56 The ball is swung over by James Morrison. 18:44 Kieran Richardson takes a shot. 17:48 Foul by Marek Cech (West Brom) on Ahmed Elmohamady (Sunderland). Free kick taken right-footed by Darren Bent (Sunderland) from right channel (25 yards), hit wall. 17:11 Indirect free kick taken left-footed by Kieran Richardson (Sunderland) from own half, resulting in open play. 17:11 Booking Chris Brunt (West Brom) booked for unsporting behaviour. 17:11 Foul by Chris Brunt (West Brom) on Jordan Henderson (Sunderland). 16:56 Attacking throw-in by Graham Dorrans (West Brom). 15:05 Defending throw-in by Marek Cech (West Brom). 13:11 Free kick awarded for an unfair challenge on Fraizer Campbell by Youssouf Mulumbu. Strike comes in from Kieran Richardson from the free kick. 12:16 Foul by Youssouf Mulumbu (West Brom) on Fraizer Campbell (Sunderland). Indirect free kick taken left-footed by Kieran Richardson (Sunderland) from own half, passed. 11:41 Attacking throw-in by Nedum Onuoha (Sunderland). 11:20 Defending throw-in by Nedum Onuoha (Sunderland). 10:39 Darren Bent (Sunderland) caught offside. Indirect free kick taken right-footed by Scott Carson (West Brom) from own half, resulting in open play. 10:02 Foul by Cristian Riveros (Sunderland) on Jerome Thomas (West Brom). Indirect free kick taken left-footed by Marek Cech (West Brom) from own half, resulting in open play. 9:28 Shot by James Morrison (West Brom) right-footed from right channel (25 yards), missed left. 9:00 Defending throw-in by Kieran Richardson (Sunderland). 8:36 Defending throw-in by Nedum Onuoha (Sunderland). 7:53 Foul by Gonzalo Jara (West Brom) on Steed Malbranque (Sunderland). Indirect free kick taken left-footed by Kieran Richardson (Sunderland) from own half, resulting in open play. 7:16 Goal kick taken long by Simon Mignolet (Sunderland). Correction - 6:53 Effort from inside the area by Peter Odemwingie misses to the right of the goal. 6:53 Shot by Jerome Thomas (West Brom) right-footed from left channel (12 yards), missed right. 5:42 Attacking throw-in by Nedum Onuoha (Sunderland). 4:42 Defending throw-in by Gabriel Tamas (West Brom). 4:14 Foul by Ahmed Elmohamady (Sunderland) on Jonas Olsson (West Brom). Indirect free kick taken left-footed by Jonas Olsson (West Brom) from own half, resulting in open play. 3:41 The ball is swung over by Youssouf Mulumbu. 3:32 Cross by Graham Dorrans (West Brom), clearance by Paulo Da Silva (Sunderland). Correction - 2:25 Handball by James Morrison (West Brom). Indirect free kick taken right-footed by Paulo Da Silva (Sunderland) from own half, resulting in open play. 2:25 Handball by Jerome Thomas (West Brom). Indirect free kick taken right-footed by Steed Malbranque (Sunderland) from own half, resulting in open play. 1:04 Defending throw-in by Kieran Richardson (Sunderland). 0:37 Attacking throw-in by Gonzalo Jara (West Brom). 0:16 Attacking throw-in by Gonzalo Jara (West Brom).